Justin's Blog » Blog Archive » Dude I Got a Dell . Today DHL came to the office with a stack boxes from Dell. Being that I work for the UNIX group we don’t often get deliveries from Dell. We actually thought that the delivery guy was delivering to the wrong part of the floor. Anyway, we opened one of the boxes and it was a 24 inch lcd monitor. 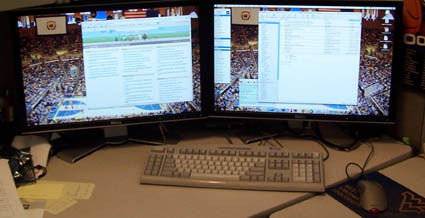 We’ve been bugging my boss Mark for dual 24 inch lcd monitors for about a year now. Needless to say I was very surprised. 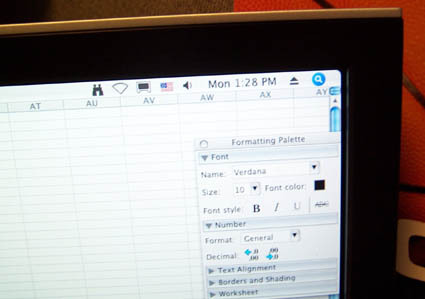 The last 2 pictures are of an excel document stretched across both screens. It goes from column A to column AY. Now if that doesn’t say productivity I don’t know what does.